You are here: Home / News / Aberdeen to be worst affected by Brexit, according to new study. Aberdeen to be worst affected by Brexit, according to new study. A new study by the Centre for Economic Performance and the Centre for Cities has produced an analysis on the potential impact of both a Hard and Soft Brexit on British cities and Local Authorities, and has concluded that Aberdeen will be the UK’s worst affected city when it comes to the economic repercussions of EU withdrawal. The analysis concludes that all British cities and Local Authorities are set to be negatively affected as a result of higher trade costs between the UK and EU, and this impact will be greater in the scenario of a Hard Brexit. Economic output in cities is predicted to be 1.2 % lower on average under a Soft Brexit and 2.3 % lower under a Hard Brexit than if the UK remained in the EU. The estimated figures are for the ‘medium-run’ impact on the economy as it is assumed that it would take 10 years for the non-tariff barriers within the EU to converge to a new level post-Brexit. It predicts that cities with large highly skilled service sectors will have the most to lose, and that in Scotland Aberdeen (1st) and Edinburgh (6th) will be most adversely affected. On a positive note, these cities tend to have higher average earnings, larger pools of graduate labour and a more innovative business base therefore may find it easier to adapt in the longer term once the economy has adjusted. Every Local Authority area is predicted to be negatively affected but cities are likely to be hit harder than non-urban areas. The average decrease in GVA under soft Brexit is 1.2 % in cities compared to 1.1 % in non-urban Local Authority areas, and 2.3 % compared to 2.0 %, respectively under a Hard Brexit. 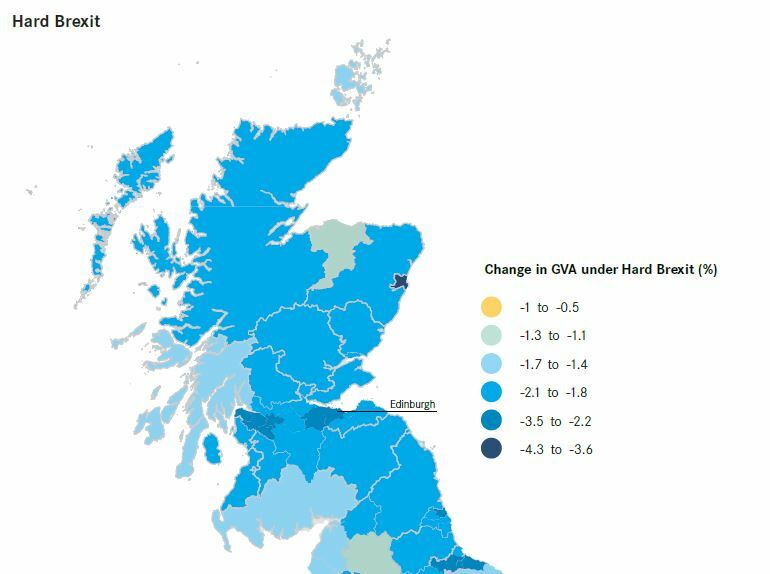 Change in GVA under Soft Brexit: Aberdeen City (-2.1%), Dundee (-1.2%), and between -1.0% and -0.8% in Angus, Falkirk, Fife, Perth and Kinross and Stirling.Change in GVA under Hard Brexit: Aberdeen City (-3.7%), Dundee (-2.1%), and -2.1 to -1.8% in Angus, Falkirk, Fife, Perth and Kinross and Stirling. http://www.esec.org.uk/wp-content/uploads/2017/07/Hard-Brexit-LAs.jpg 574 770 Joanne Scobie http://www.esec.org.uk/wp-content/uploads/2015/01/esec-logo.png Joanne Scobie2017-07-28 13:12:542017-07-28 13:12:54Aberdeen to be worst affected by Brexit, according to new study.